Some people call terrazzo Venetian mosaic, thanks to its appearance. This flooring consists of granite and marble chips, which are set in strong concrete or resin. A terrazzo floor is highly durable and offers a unique look. It’s also flexible, with an end result to suit your needs and tastes, and it’s invariably beautifully elegant. Although chipping is possible, it doesn’t happen easily. Essentially, a terrazzo floor stays looking just as it did the day you first got it, year after year. That makes it ideal for high-traffic areas such as hotel lobbies. Equally, because terrazzo doesn’t absorb liquid easily, it’s quite hard to stain it with anything. If you do have any spillages, you can just wipe them up really easily. It’s an incredibly versatile product, too, one that people are using in incredibly diverse settings across the world, from hotels to banks, office receptions and supermarkets as well as in homes. The costs of the various materials, and the professional installation, makes terrazzo flooring one of the pricier options on offer, but, for the stylishness of the end result, for most people who have terrazzo, it’s a price worth paying. Terrazzo does need to be installed professionally, and that’s a specialist job. Fitters pour layers of concrete, and then sandy concrete, before adding the mixture of stone or glass chips. They then sand everything down for a smooth appearance, then add the finishing coat, and, finally, polishing the floor. So this really isn’t something you’d want to do yourself without previous experience. As we’ve seen, cleaning is a very straightforward business. Just sweep and mop. Use a soft broom and then don’t be afraid to use plenty of water on your terrazzo floor. Then use a steam cleaner with a hard-floor attachment to get all the water off the floor with suction power – and you may need to repeat this process – before rinsing the floor with clean, cool water. At Royal Stone Care, we’re specialists in looking after surfaces such as terrazzo. 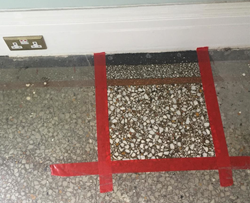 Equally, if you’re looking for a full restoration service for your terrazzo in London, again we can help – we cover the whole city and around. Get in touch today. This entry was posted in Floor Cleaning and tagged Terrazzo Care London, Terrazzo Cleaning, Terrazzo Restoration. Marble Encounters of the Weird Kind – Or Is It Me?